A good river hunt is the result of a process of scouting, planning and executing the hunt. Each step requires a unique blend of gear and knowledge. One of the best elements of big-river duck hunting is the number of strategies that are effective for a variety of species. A puddle duck spread for the mouth of the Columbia River is also useful for a backwater hunter on the Mississippi River, and the ideal duck boat for the St. Clair system can work pretty well in Venice, La., too. No two bodies of water behave the same, but big-river waterfowlers can use similar tactics no matter where their scouting has taken them. Sean Evans, a Zink Calls pro-staffer from Spring Hill, Kan., does much of his hunting on the nearby Missouri River, particularly during the late season. "Hunting a big river is a challenge, and it's gear intensive. It takes knowledge and skill to do it successfully, but the variety of species you can kill is staggering," he said. "We've taken redheads, canvasbacks, mallards, mergansers and limits of giant Canada geese all in the same trip. 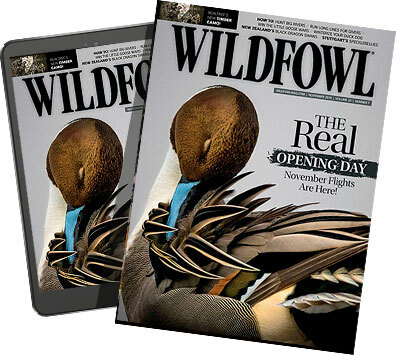 When the conditions are right, the sheer number of birds that can be in a 5- or 6-mile stretch of the river is phenomenal â€” and many times, we're the only guys out hunting them." Evans keeps an eye out for a certain blend of conditions before making his first river duck expedition of the year. "I need it low and I need it cold," he said. "We usually hunt geese that are roosting on giant sandbars between wing dams, and for those sandbars to be exposed, the river has to be at 10 feet or less." Evans and his buddies scout to find large concentrations of geese roosting on sandbars. "Once we know our area, we boat in from upriver of it well before daylight," he explained. "A GPS is critical. We cut the motor off 100 yards upstream and drift the rest of the way in. Though we'll certainly kick up geese from the sandbar, this quiet approach doesn't alert the birds too much. "Typically, one side of the sandbar will have a slack-water pool, and the river channel will be on the other side. We line 10- to 15-dozen sleeper shells on the sandbar and load the end of the bar with full-body decoys. We supplement that with six-dozen goose floaters in the slack water. We may add in a few duck decoys, but it's amazing the number of ducks we'll kill over an all-goose spread." Evans hunts from a boat blind set against a high bank and concealed with driftwood, downriver from the head of the decoy spread. "We find that the geese decoy into the full bodies and the floaters sitting in the slack water most of the time," he said. Gregg Silverberg grew up hunting the Platte River in central Nebraska. Although this Missouri River tributary is a major waterway, it is much shallower than most North American rivers of comparable size. That, combined with its location in the Central Flyway, makes it a preferred stopping point for thousands of ducks and geese, but it also means frequently dealing with icy conditions. "Where we hunt on the North Channel, the shallow water near our blind can freeze pretty quickly, but we'll use a spread comprised almost completely of field goose decoys and still get our birds," Silverberg said. "The geese will decoy right in on the ice. Our spread is huge at 35- to 40-dozen goose decoys, so it's semi-permanent." Despite not being able to deploy the whole spread on a daily basis, Silverberg said adjusting portions of it to mimic the birds' behavior under a given set of conditions makes a world of difference. "When it's especially cold, geese seem to sit in really tight groups on the Platte," Silverberg said. "So when we're trying to decoy geese over the ice, bunching our Big Foots into a tight cluster really seems to help. We also place a bunch of sleeper decoys around the blind, and quite a few more out on the sandbars. And often when these conditions are present, the best hunting is at midday, from about 10 a.m. to 2 p.m."
If any open water is available in the river and it's free of slush ice, Silverberg sets a few-dozen floating duck decoys. If slush ice is flowing and tangling decoy lines, he supplements his goose decoys with a few field duck decoys. Mario Friendy of Sherwood, Ore., owns Columbia River Decoys and does much of his duck hunting near the mouth of the Lower Columbia. This estuary is full of small islands and is heavily influenced by tides from the Pacific Coast. "The puddle duck hunting here is difficult but rewarding," he said. "There have been many guys who tried it and quit in frustration after a few trips. The old guys here are often the best, because it really does take experience to be successful. It's duck hunting in its wildest form." Tidal swings range from 6 to 10 feet, and when the tides rise, they inundate many of the islands with shallow floodwater, where ducks swarm to take advantage of short-lived food sources. It's a similar situation to backwater hunting on a major inland river, but on a much tighter time window. Because the opportunity is so short-lived, Friendy and his buddies can't do much scouting. They must combine tide predictions with past knowledge to plan the hunt. Much of the time, they find themselves set up in their boat blind in cuts or chutes between two islands. "You can't just pull right up on an island in a foot of water and start hunting, because when the water falls out, you might get stuck there," Friendy said. "Our setup has to be fast and mobile and designed for rapid water-depth changes. "We have 20 feet of decoy line on our decoys and 6-ounce weights on the ends of them. A big spread for us might be just three-dozen decoys because when the water's falling, three-dozen is quite a few to pick up. But we're using decoys that I carve, which are magnum-sized, and we make sure they're clean and in good condition. Most are mallards, but we'll blend some wigeon and pintails into them as well. We just set the spread so there's a hole in front of the boat, but not too close. When those ducks are working straight in, I don't like them looking right into the boat." Joe Balog is the son of a charter boat captain on Lake Erie and is a fierce competitor in pro-level bass-fishing tournaments on the Great Lakes, but duck hunting Lake St. Clair is among his favored pursuits. Much of Balog's hunting takes place on the shallow waters of St. Clair Flats, so he needs a rig that provides both shallow-water utility as well as open-water stability. "I may be crossing the St. Clair or Detroit River channel in the dark and then running for a mile over a sandflat that's 7 inches deep," Balog said. "So I was very particular when setting up my boat. I wanted the lightest possible combination that could be pulled over a levy if needed, but is still safe for open water. "I chose an all-riveted 14-foot, modified-V aluminum boat with a 23-horsepower mud motor. It's wide enough to handle big water, and the mod-V front breaks the waves and chop, rather than slap them like a flat-bottom would. With a 48-inch boat, you have much more beam, stability and flotation, and you can load more weight on the bow than you can with a narrower boat. But I can still run it through ankle-deep water." In an area of the country with a lot of people and an abundance of big water, Balog is routinely amazed at the risky behavior he sees on the water each year. "One thing I see quite often is guys overloading the rear of their boat and only leaving themselves a little freeboard above the waterline," he said. "My battery goes in the rear of my boat, but it's important to remember how heavy the motor is. The gas tank and anything else that's heavy is moved toward the center and front of the boat. Once a wave comes over the stern and puts a little water in the back of the boat, you're in a bad spot. When a second wave comes over, that's when you sink." Balog urged all big-river hunters to be especially cautious. Mistakes are costly in this environment. "It's one thing to be in 3 or 4 feet of water and have trouble," he said. "But when I'm crossing a main river channel, I treat it as if I'm crossing lava in a volcano. Everyone sits still in their assigned spot, wears a life jacket and the dog is leashed down. If you fall into deep water that's 37 degrees with current, you're dead in just a few minutes."